U.S. Census records project that our population of 65 and older far outpaces population growth. 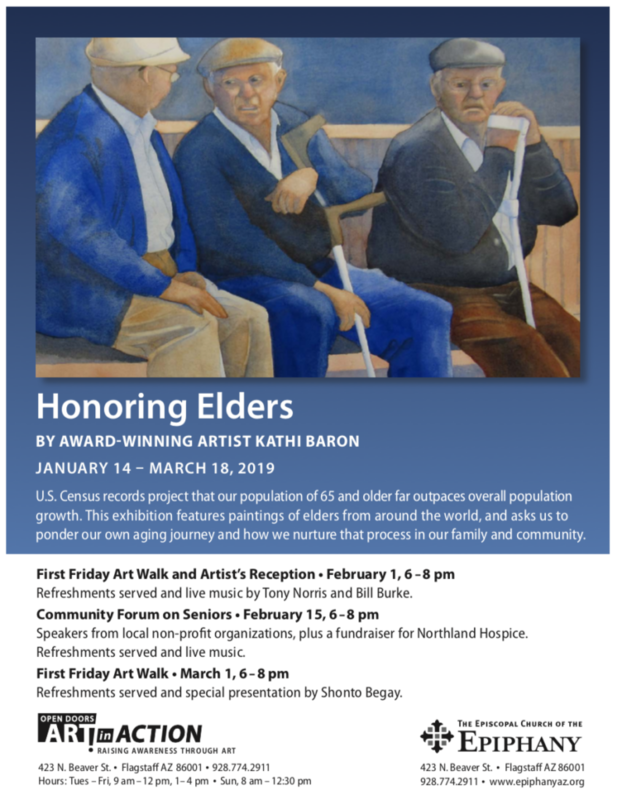 This exhibit featuring paintings from around the world, and asks us to ponder our own aging journey and how we nurture that process in our family and community. The exhibit is currently on display at the Episcopal Church of the Epiphany, 423 N. Beaver St., Flagstaff. Visit here or https://www.epiphanyaz.org for hours or more information. First Friday Art Walk and Artist Reception, 6 to 8 p.m. Friday, Feb. 1, Episcopal Church of the Epiphany, 423 N. Beaver St., Flagstaff. Refreshments served and live music by Tony Norris and Bill Burke. Community Forum on Seniors, 6 to 8 p.m. Friday, Feb. 15, Episcopal Church of the Epiphany, 423 N. Beaver St., Flagstaff. Speakers from local non-profit organizations, plus a fundraiser for Northland Hospice. Refreshments served and live music. First Friday Art Walk, 6 to 8 p.m. Friday, March 1, Episcopal Church of the Epiphany, 423 N. Beaver St., Flagstaff. Refreshments served and special presentation by Shonto Begay.